This comforter set came in a very timely manner and was exactly what i was looking for love it!I love the way it looks on my bed. The comforter where perfect sizing to fit properly on my bed. I will also be purchasing from this site again as well very soon. Invigorate your space with the Madison Park Essentials Loretta 24 Piece Room in a Bag. The lavish tufted details flaunted on the comforter, shams, and window valances deliver an elegant statement in rich purple hues. A large border frames the luxurious comforter, adding charm and dimension to the bedding set. Matching shams echo the motif seen on top of the bed, creating an elegant look in your space. An included microfiber sheet set and bed skirt complements the bedding collection and offers exceptional comfort and style. Two Euro shams and four decorative pillows help to complete the bedding set, giving it a finished look. Accompanying this bedroom set are four window panels with four tie backs to keep curtains drawn open, while two tufted valances provide the finishing touches to your bedroom. Beautiful 24 piece bedding set! Colors are true to stock photo. Everything arrived on time and all together. I have had the set for a few months now and the quality is excellent. The sheets wash well, but I would take the comforter to the cleaners. 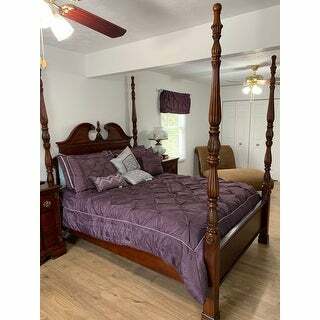 This set looks great in my bedroom and is comfortable,however the color is slightly darker than the picture shows,other than that this is a great fit for my California king! Love this set. Color is amazing. Wish they sold extra pieces separately! Nice comforter. However, I had to return it because some pieces were missing. This is a really nice comforter. A perfect fit. I will definitely buy it again. The color is perfect and the size is just right. Thank you Overstock. I love anything plum. The 24 pieces looks simple, yet classic. This bedding is by far the most comfortable bedding I have ever had! The quality is superb and it is even more beautiful in person. This is such a nice set. I've only had it for a day so I'll update in about a month or so on how it holds up. Its soft, sturdy and feels nice and warm. I really like it. Beautiful set however when I washed it the first time part of it came apart! I thought it was a shimmering purple but it’s just purple but still great. The color is beautiful! It looks exactly the same in person as in the photo. Highly recommended. "What size pillows do I need for the euro shams?" The dimensions of the Euro sham are 26 inches W x 26 inches L x 2 inches D.
"I bought this comforter and love it. This complete set with curtains wasn't available at the time I purchased it. Are the window valances available separately?" Unfortunately no, the valances are not available separately. "What is the accent color, white or gray. I can't tell for sure by the picture. " The accent color is grey. I hope it helps. "I would need another set of curtains and 5 more valances. Are they available to purchase?" No, additional curtains are not available. To begin with, the Brand, Madison, and then the color is the exact shade of plum I was looking forand it's polyester. The beautiful design caught my eye immediately and it just looks so comfy. Then of course , the Bonus reading the content of items in this set! 24!! I have been looking for some time now for the right one, I saw this one and bam!! I purchased immediately....something I do not do. Can't wait till it atrives!!! Thank You!! "Can you get and extra pair of curtain with the sets"